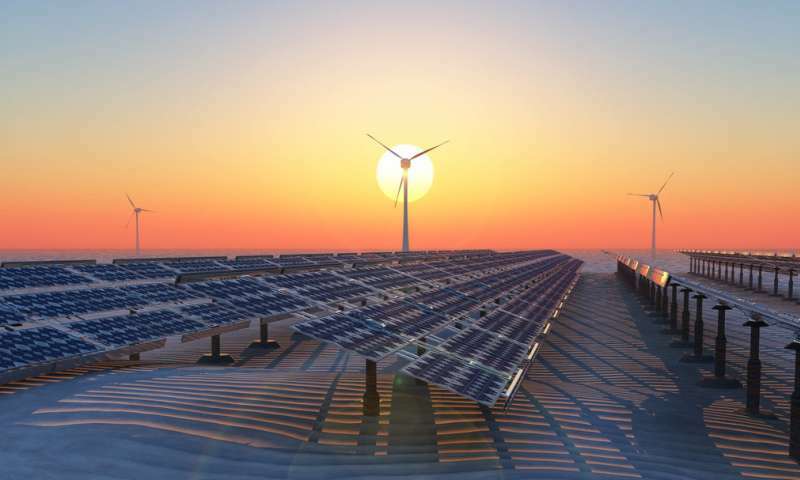 What if the Sahara desert was turned into a giant solar and wind farm, for instance? This is the topic of new research published in Science by Yan Li and colleagues. They found that all those hypothetical wind turbines and solar panels would make their immediate surroundings both warmer and rainier, and could turn parts of the Sahara green for the first time in at least 4,500 years. 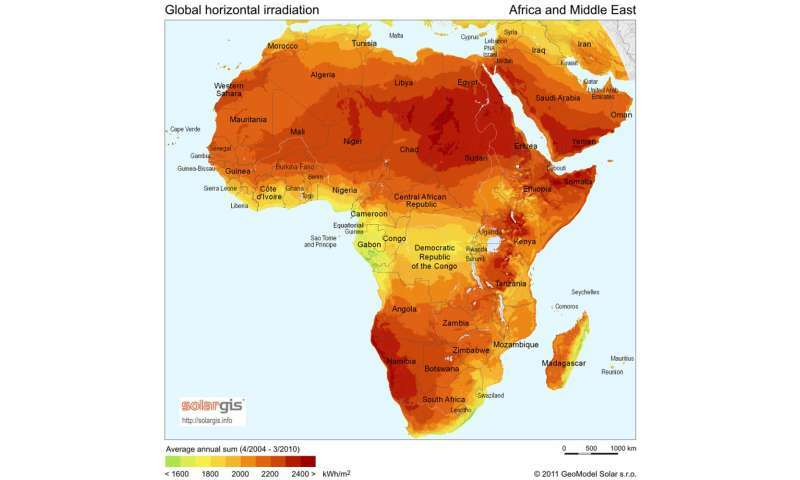 The scientists behind the research looked at the maximum amount of solar and wind energy that could be generated in the Sahara desert and the transition region to its south, the Sahel. The two regions were picked as they are relatively plausible sites for such an enormous roll-out of renewable energy, being fairly near to substantial demand from Europe and the Middle East, while having limited other demands on the land. Both have substantial potential resources of wind and solar energy. Li and colleagues also suggest that The Sahel, in particular, could also benefit from economic development and more energy for desalination, providing water for cities and agriculture. As the two regions are so large, the solar and wind farms that were simulated in this study are the size of entire countries – 38 times larger than the UK. They would be vastly bigger than any existing solar and wind farms, and could provide up to four times as much energy as is currently consumed globally. This would prompt quite significant changes in the local environment – massive wind farms would raise temperatures by around 2℃ for instance, similar to the amount of global warming we are concerned about. Solar would cause a smaller temperature change, around 1℃. Precipitation increases of 0.25 mm per day associated with wind farms sound more modest, yet this would be almost double the previous amount of rainfall. Again, the effect associated with solar parks was smaller – an increase of 0.13 mm/day – but still significant when added up over a year. Wind farms largely cause temperature increases because their turbine blades bring warmer air down to the surface, especially at night. This has been observed in field studies and using remote sensing. They have also been shown to increase moisture in the air. Solar panels mean more solar radiation is absorbed and less of the sun's energy is reflected back into space. This causes the land surface to warm up. Several studies have shown this, including one which showed that the effect of warming caused by fossil fuels, via carbon emissions, was 30 times greater than the warming caused by solar photovoltaics absorbing more solar radiation. However, temperature effects may vary within the solar park and with season. 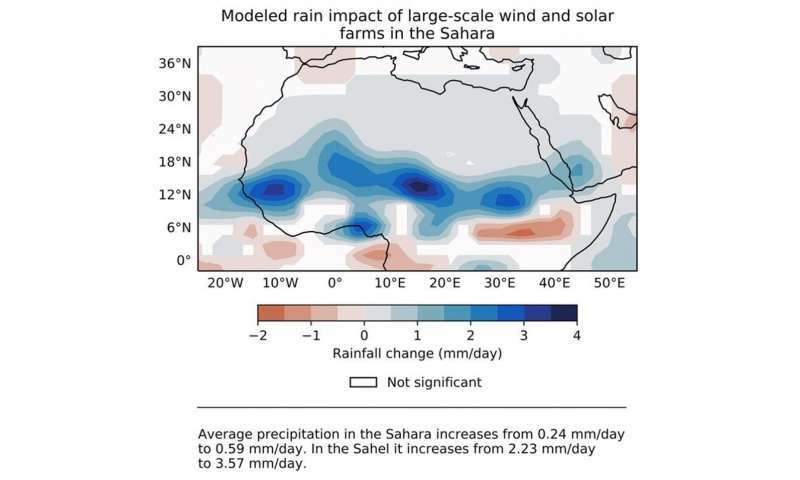 In the Sahara simulation, extra rainfall happens because wind turbines represent an obstacle to free-flowing air, slowing it down and reducing the effect of the Earth spinning on air flow. This lowers the air pressure, and the difference in pressure between the Sahara and surrounding areas causes wind to flow there. When the air meets, or converges, in the Sahara it has nowhere else to go but up. As the air rises, water vapour in it condenses and rain drops form. For solar, the process is slightly different: warmer air, heated by the panels, simply rises. However, this also promotes low pressure, causing air to flow there, converge and rise. More rainfall also means more vegetation. This increases surface roughness, as with wind turbines, and causes more solar radiation to be absorbed, as with solar panels. This reinforcing cycle is known as a "climate feedback" and incorporating these vegetation feedbacks is a novel aspect of the research by Li and colleagues. Time to make it a reality? Not quite. Decisions aren't made in response to environmental impacts alone – if this was the case we'd have already ditched fossil fuels. It's certainly true that developing a mega renewable energy site across the Sahara and the Sahel would be a game-changer, but there are lots of other factors to consider first. These areas may be sparsely populated but people do live there, their livelihoods are there, and the landscapes are of cultural value to them. Can the land really be "grabbed" to supply energy to Europe and the Middle East? Coherent and stable energy policies are challenging enough within an individual nation, let alone between nations with all the potential political implications and energy security issues. Though mass amounts of cheap Saharan energy sounds like a great thing, it is not clear it would be a secure enough investment for the economics to add up. It's also hard to tell what this would mean for desertification, which is caused by poor land management, such as overgrazing, as well as by the climate. The changes to rainfall looked at in this study are regional, not global, and once the wind and solar farms were taken away their effects would disappear and the land could revert back to its previous state. Overall, this is an interesting and important piece of research, highlighting the need to be mindful of unintended consequences, be these positive or negative, of the energy transition. Integrating these findings with other social, economic, environmental and technical considerations is essential to ensure we don't leap from the frying pan into the fire.